In 2010, the word gamification became one of the leading buzzwords in education. Since then, it has been reported that 80% of gamification projects fail. Why do these games fail when it has been proven that game play in a corporation does engage the learners and creates a better learning result? There are five factors that every gamification project needs to be successful. It does not matter how the game is delivered or what industry. 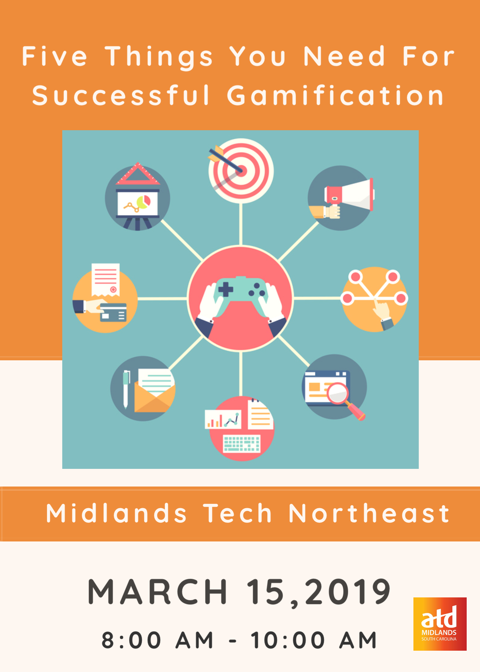 Come and learn the five factors that must be included in any gamification project. Identify the role of learning objectives in a gamification project. Connect game mechanics to game activities. Apply personas and build a story for engagement. Hot coffee and breakfast served starting at 8:00. Jeffrey Riley is a Certified Gamification Master Craftsman with Sententia Games. Jeffrey has been using game ideas in eLearning for several years. With the improvement of additional tools in Articulate Storyline, it is now possible to design learning games. Jeffrey helps bridge the gap between knowing the software and applying game mechanics so it feels like a game and learning takes place. His years of experience in learning and working with businesses guide participants in solutions they can apply.